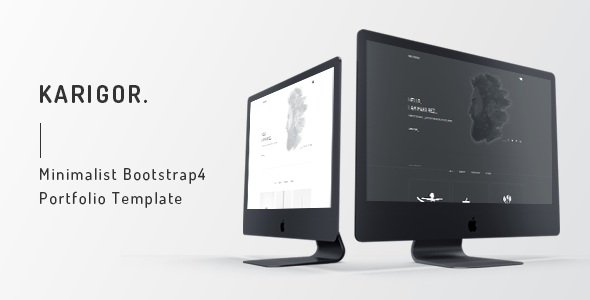 Karigor – Minimal Bootstrap 4 Portfolio Template is a clean, modern, and beautiful HTML5 template. This creative and pixel perfect design is wonderfully lightweight and mobile-friendly. In addition, Karigor is a fast, flexible, and fully customizable because we have added user-friendly code. The most responsive design is perfect for a blog, professional portfolio website, and landing page or tech startups. Moreover, Bootstrap 4 based Karigor minimal template comes with 3 Homepages, along with total 18+ pages. You can easily personalize your online portfolio and highlight your portfolio or blog as usual. This cross-browser optimized template offers the Smooth Animation, Google Font, Font Awesome Icon, Dynamic Contact Form with Ajax, Clean Markup, and Make with SASS . Therefore, Karigor – Minimal Bootstrap 4 Portfolio Template is well-documented and ensures lifetime free updates. Get it now and show off your work to the world!